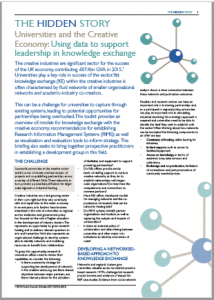 The Hidden Story research project has published a major report into the contribution of university knowledge exchange to the creative economy. 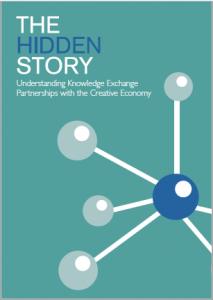 The AHRC-funded research The Hidden Story: Understanding knowledge exchange partnerships with the creative economy was led by Kingston University with collaborators from Alliance universities. 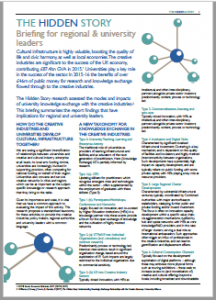 It mapped the ways in which higher education institutions support the creative sector and help to build cultural infrastructure, developing a new taxonomy for these activities, which are supported by nearly £50million of public funding each year. 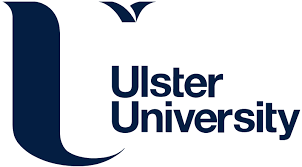 The project has also published briefings with recommendations for national policymakers and regional and university leaders on how universities and the arts can work together to create more value for creative industries, and on how to use data to support leadership in knowledge exchange. 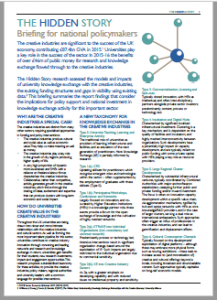 Click on the images to download the report (right) and the briefings (below). You can find out more about the Hidden Story project here.